Swindon have signed striker Jordan Stewart from Northern Irish club Glentoran on a two-year-deal. The fee for the 20-year-old forward is reported to be £50,000. 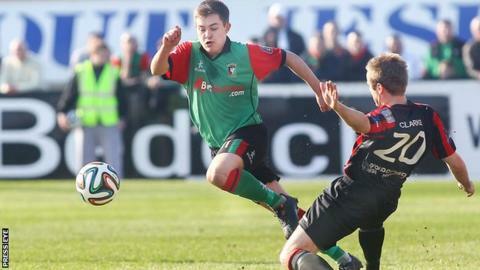 He joined Glentoran in 2013, scoring 16 goals, including a hat-trick against Warrenpoint Town last term and has previously spent time on trial at Stoke City, Middlesbrough and Peterborough. "It feels great to be here," Stewart said. "I looked out there, the pitch is quality and it's a lovely ground." He added: I'm definitely excited to get started. "I'd like to wish Glentoran all the best but it's time for me to move on and I'm happy to be at Swindon now. I can't wait to get out there, start training, force my way into the team and take it from there."